The EV-700 Digital Announcer from TOA Canada can be operated in conjunction with a variety of external devices. When incorporated into an existing TOA PA system, it provides benefits including, manual or automatic distribution of timed and repeated announcements, background music, along with other audio programs. Users can easily create or update sound source files and programs directly or remotely via a network. Should an emergency arise, prerecorded emergency messages are ready for priority broadcast. 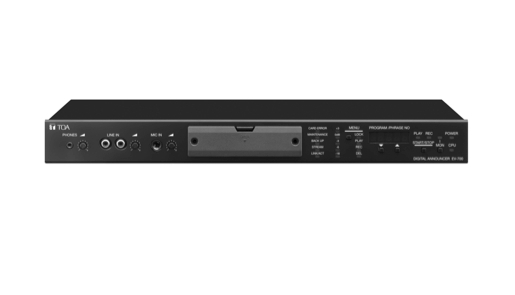 This product features 35 preinstalled sound source files, with a storage capacity of 32,768 sound source files and 26 audio programs. Dedicated software enables the user in any networked location to create, edit, store and activate broadcast programs from a PC. Programs can be synchronized so that they are broadcast simultaneously across the network. A R.E.M. (Recording Endless Message) function enables repeated playback of emergency announcements to ensure occupants are quickly notified or evacuated when an emergency arises.